It did not come as a surprise. 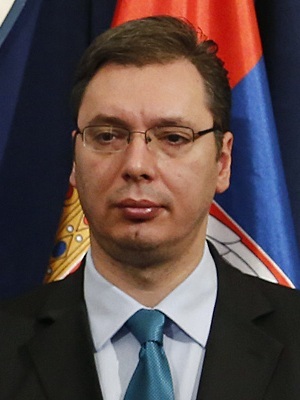 The new prime minister of Serbia is popular, smart and charismatic. Aleksander Vucic, the new superhero of Serbian politics, received some 49% in the parliament elections on Sunday. His center-right progressive party (SNS) won thereby a majority in parliament with 158 seats (and more than doubled its representation up from 73) in Serbia’s 10th elections after the re-introduction of multiparty introduction in Serbia in 1990. According to the first results of the polls, two years earlier than originally scheduled, led to the following results: The Socialist party (SPS), led by (so far) prime minister Ivica Dacic gained some 14% that translate to some 44 seats. The Democrats (DS) were crashed and receive 19 seats (down from 67! ), the New Democrats (NDS) of Boris Tadic 18 seats, the Alliance of Vojvodina Hungarians six seats, the Democratic Action of Sandzak (SDA) three seats and two ethnic Albanian representatives of Democratic Action-Riza Halimi will be represented in the 250-member strong parliament in Belgrade. The turn-out with 50.3% of the 6.7 million people eligible to vote was rather low for Serbian standards. Several established parties in the opposition most likely have failed to get over the 5% hurdle, including the Liberal-Democrats (LDP), the United Regions of Serbia and the national-conservative DSS. The final results, however, will only be known by 20 March 2014. Vucic endlessly repeated that he would need a strong majority in parliament to get through reforms that make the country ready to join the EU. Vucic was once a staunch nationalist and pro-Russia, also serving as a minister under Milosevic. However, he switched sides and was also mainly responsible for signing a historic treaty with Kosovo under the auspices of EU’s High Representative Catherine Ashton in April 2013. And now the 44-year old will be the new prime minister who wants to lead Serbia into the EU. So far it is not clear whether or not he will continue the alliance with Dacic in parliament. If so, it would be a total dominance in parliament. During the election campaign, however, Vucic blamed Dacic to be close to drug business which certainly did not strengthen their ties. Obviously, voters trust him that he will be able to lead Serbia into the EU until 202 as I wrote in a blog post in January 2014 after the EU started accession negotiations. Although everyone expected a big victory of Vucic, the kind of success was nonetheless surprising for observers as Vucic is the first one in Serbia’s democratic history to have a majority in parliament. However, this will be a long and difficult process. The EU has to make sure that Serbia will receive enough support but at the same time has to make clear that the fight against corruption, nepotism and organized crime is continued. That is exactly what Vucic also has promised to Serbs that he will continue his battle against all forces that undermine the development of Serbia. It is not just talk as he went against very influential business men and put them into prison. That made him popular as for many Serbs the business elite seemed to be untouchable. There is not much ideology behind Vucic, he is rather a man who wants to change things with reforms. The opposition has cried out foul that he would only go after his political opponents and leave his supporters in security. Moreover, there is stark criticism from the opposition that Vucic has used the yellow press in his favor thanks to his influence and providing them exclusive information when a police action is going against a mafia boss. There will be a lot of power in the hands of Vucic – all the more important it will be to keep an eye on him. Now, Vucic wants to create prosperity, while at the same time he needs to implement austerity measures and redundancies for workers in the country’s huge public sector (an estimated 740,000!). Already now the official records say that 25% are unemployed, the numbers surely are even higher. The prospect for growth is minimal with the most optimistic projections predicting 1% for 2014 but most likely the GDP will slightly fall. The big question is how it will be possible to reform Serbia. One remains puzzled but hopeful that Vucic will save this country and its people. Update 3/17/2014: There was a slight change in the distribution of seats in parliament and the numbers were adjusted accordingly.